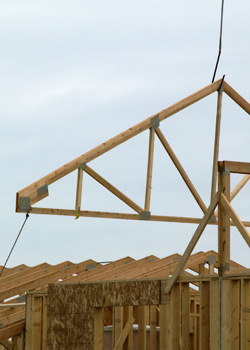 Littfin Truss Co. offers a wide variety of Engineered Wood and Steel Products for the construction industry. All your truss needs for Residential, Commercial, and Agricultural. Nail Laminated Columns and Glue-Laminated Columns custom built to order using Machine Graded Treated Lumber. Littfin Truss Co. offers professionally-trained staff who can properly convert your floor, roof, or Tall Wall system from dimension lumber to a fully-engineered system. Littfin Truss Co. carries a full line of USP hangers and Connectors. With USP's factory only an hour away, we can get you custom, quality connectors fast and on time. Custom Structural Steel for all your Residential and Agricultural needs. Our Mission: To be the Leading Supplier of Engineered Components to the Dealer Market that we serve.